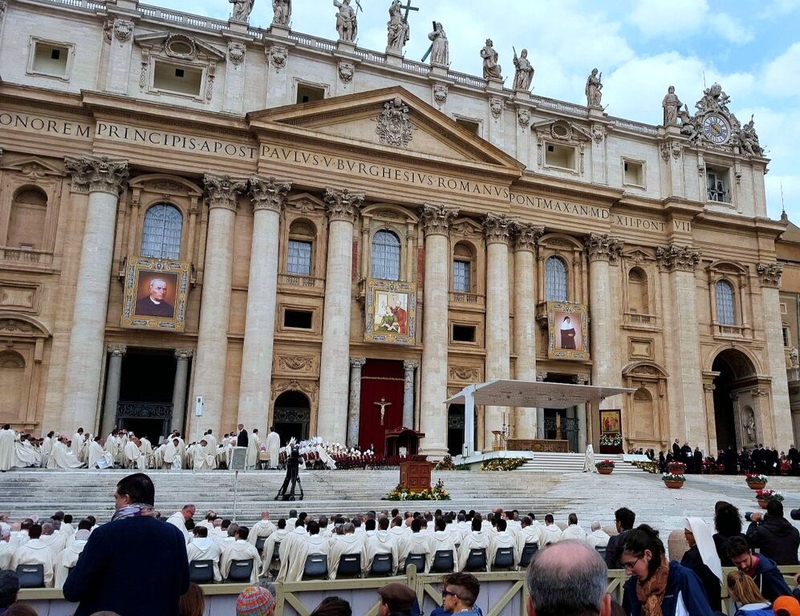 Photos of my pilgrimage to the canonization of Saints Louis and Zelie Martin in Rome, October 18, 2015. Mackenzie, a young American who was studying in Ireland, had courageously traveled alone to Rome to participate in the canonization. We toured the excavations under the basilica together, and she gave us a tour of the basilica, sharing with us everything an American seminarian who had given her a tour the day before had taught her. The heroes of the piece: old and dear friends who crowned their kindnesses by inviting me to accompany them to Rome. 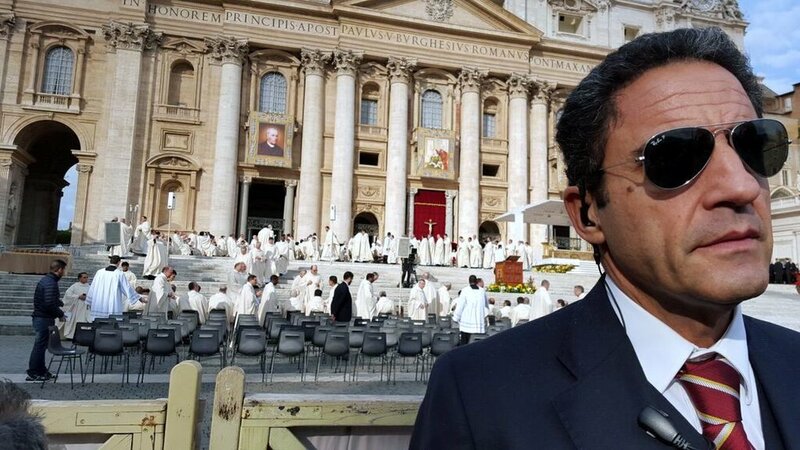 so that I could attend the canonization. Lorraine arranged for us to take the famous Scavi Excavations Tour. We saw St. Peter's original tomb, his present tomb, the catacombs, and many other precious sites. This photo was taken immediately afterward. Pilgrims visited the Carmelite Generalate in Rome to get these tickets. Note an error that appeared in several Roman documents: Zelie's name is given here, in Italian, as "Maria Zelia." In fact, her baptismal name was "Azelie-Marie." Our hotel, across from the Vatican Museum, was only a 20-minute walk from St. Peter's. Resisting friends who wanted us to leave at 5:30 a.m., we set out at 6:30 a.m. As it was early, dark, and cold, and we wanted to get in line as early as possible, we decided to take a taxi. Once inside it, we were convulsed with amusement at the thought that we were actually taking a cab to a canonization ceremony! The Square, in the dark, had a magical night-before-Christmas atmosphere. We joined a crowd of people from many countries and had time to get acquainted with some young Americans studying in Rome. A beautiful spirit moved among us. As the light comes up in the sky behind the basilica, Lorraine and I continue to wait for entry to the canonization ceremony. The sun was up by the time Lorraine and I neared one of several security checkpoints. The crowd was friendly, and we were able to give away an extra ticket. But the moment the checkpoints opened, all smiles stopped together. Everyone raced for seats. As soon as Lorraine was cleared, she said, "Don't lose sight of me; I'm going to run." Jon and I stood dumbfounded as she sprinted gazelle-like past hordes of younger people and snagged three choice seats in the eighth row. on the aisle. A group resembling a labor union (of Italian men wearing gold caps in support of St. Vincenzo Grossi, who was canonized with Sts. Louis and Zelie) wanted to colonize our seats, but Lorraine fended them off with a fervor worthy of the first Christians. This particular miracle left us feeling irresistibly light-hearted, like school children, and we wore our green Louis and Zelie scarves with elan. Ranks of white-robed priests filling in the space before us. The banner depicting Louis and Zelie, the first couple canonized, hung in the place of honor over the crucifix. I kept remembering May 17, 1925, when, in the same location, Therese was canonized (alone), and wondering whether anyone who'd been present that day had imagined that her parents would be raised to the altars ninety years later. In their 19 years of marriage, so rich in love, faith, tragedies, and cares, could they have guessed that their exquisite attention to the details of everyday life would blossom first in their daughter's "way of confidence and love" and later in the recognition of their own sanctity? More than seven years had passed since the morning in January 2008 when I read that Louis and Zelie were to be beatified later that year. Although everything we have done since then to make them known is only the beginning., the canonization day was one of profound joy and gratitude. The Square on canonization morning before the Mass began. With Jon Frankle before the canonization Mass. The first canonization ceremony any of us had ever attended. Probably dressed only a little less elaborately than the two officers who, on November 20, 1887, dragged the young Therese Martin away from the feet of Pope Leo XIII. Rome was much sweeter for the memory of St. Louis Martin's visits there in 1885 and in 1887. Rows of mitred bishops await the Pope . . .
at the canonization ceremony of the first spouses canonized togther. We finally arrived in Rome at six-thirty in the morning. For me. Saint Peter's is really the most beautiful thing in the world. I prayed for you, whom I love so much. It's so pleasant to pray here! . . . I place you all in the grace of God and pray for you every day in Saint Peter's. The thought of your mother also follows me constantly. The altar of sacrifice reminded me of the altar Louis Martin donated to St. Pierre's Cathedral in Lisieux in 1888. Therese wrote "Papa had just made a donation to God of an altar, and it was he who was chosen to be offered as victim together with the Lamb without spot." The crowd strains to see Pope Francis . and to photograph him after the Mass of Canonization. Some people waved; many simply lifted their cameras. Even though the Mass was outdoors, I could not bring myself to take pictures during it, so I have only photos from before and after the ceremony. I prayed with and for all my readers and all who love the Martin family. after the Mass of Canonization. His joy at seeing the people and their deep affection for him were very moving. We owe this photo to the fleet-footed Lorraine Hirsch. Immediately after the Mass a miracle happened that reminded me of Therese's assurance "More than ever, I realized how the smallest actions of our lives are guided by God; He makes us desire, and then grants our desires." When I was in Lisieux for the beatification in 2008, I had the pleasure of seeing, in front of the Carmel, the family of Pietro Schiliro, the child whose healing as a newborn in 2002 was the miracle for the beatification of Louis and Zelie. He was then six years old. I had had the pleasure of writing about this family, and I wanted very much to see them in Rome, The crowd was so vast that it took ages to leave the Square. As we approached the colonnades, I glanced to my right, and there, at my very elbow, was Pietro's mother, Adele. I saw Valter and Pietro a few yards ahead of us, and quickly explained to Lorraine that I'd like to see them all. While Mrs. Schiliro stopped and spoke to me most graciously, Lorraine dashed ahead and returned with Pietro, now 13, and his father. A smiling Carmelite friar who was accompanying the Schiliro family waited patiently while we talked and while these photos were taken. What were the odds of finding them in that huge crowd? A canonization gift from God. The healing of the newborn Pietro raised Louis and Zelie from Venerable to Blessed and opened the way for their canonization. The family's profound awareness that the healing of Pietro's physical illness was only the manifestation of a profound experience of faith has edified me very much. I rejoiced to see them and was proud to be photographed with them. 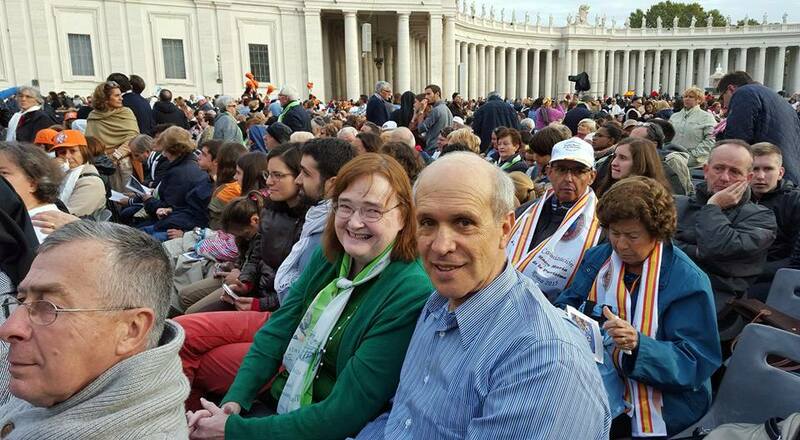 Father Sangalli, who first urged them to pray a novena to Louis and Zelie, was later named vice-postulator for the Martins, and it was a joy to see him on the happy occasion of the canonization that fulfilled his efforts.